The tomato hornworm is one of our best known garden pests. It’s almost as big around as your thumb and can be 4 to 5 inches long. It’s bright green and has a hornlike hook at one end that can be either red or green depending on which of the two species you have on your plant. After feeding, hornworms move to the soil where they pupate and spend the winter. The following summer the pupae transform into five-spotted hawk moths and start the cycle over. 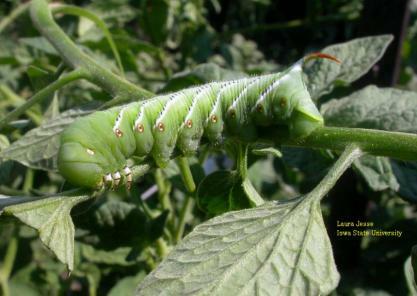 Tomato hornworms feed on the leaves and fruit of tomatoes and other vegetables including eggplant, potatoes and peppers. They can quickly defoliate portions of the plant, reduce its productivity, and heavily scar the fruit. Toward the end of the summer when the caterpillars are fully grown, it seems they can eat about a leaf an hour! The first control option is to pick the caterpillars off your plant by hand. They won’t hurt you but the challenge is that they are well camouflaged. They are the same color as the foliage so it will take some hunting to find them when they are small. When they are big, they will be easier to find but then that means they will have grown and developed by feeding on your tomato foliage already! Another control option is to use a biological insecticide known as Bacillus thuringiensis or Bt or a synthetic home garden insecticide available in local garden centers. Be sure to follow label directions.